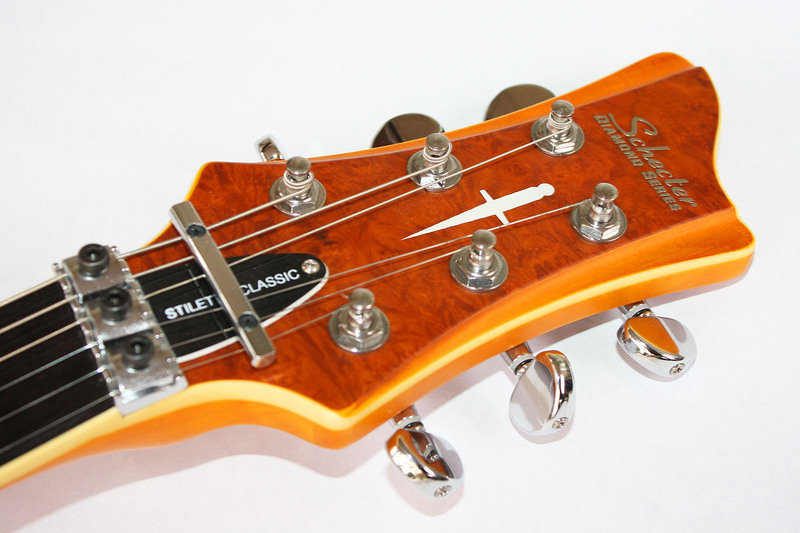 The Schecter Stiletto Classic is one of four limited edition classic guitars available for a short period of time around 2009. 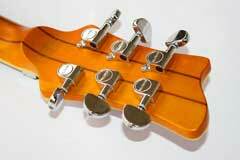 Other guitars included the Ultra Classic, Solo Classic and Hollywood Classic. All these guitars had features or upgrades not typically found on standard Schecter guitars. Highlights of the Stiletto Classic include active EMG pickups, neck thru construction with access to 24 frets for full 2 octave range on each string, and a bound ebony freeboard. 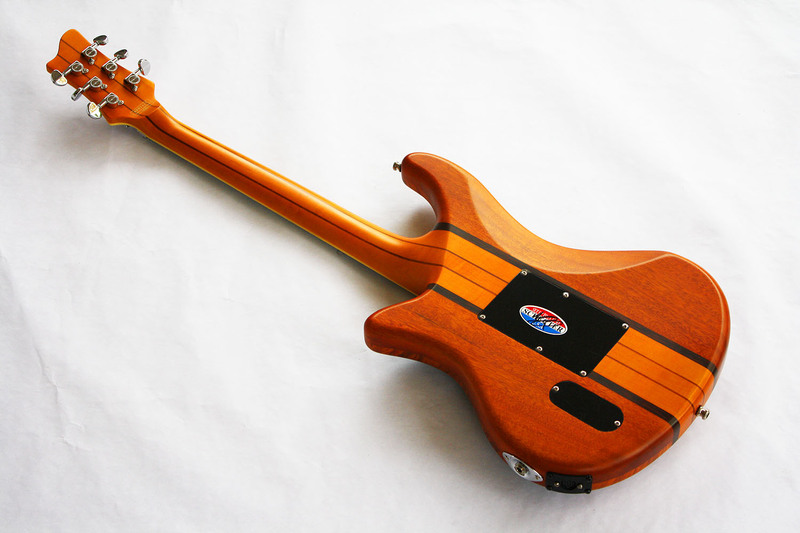 Vintage guitar synthesizer enthusiasts will recognize the same feature set in the Stiletto Classic as in the famed Roland G-808 guitar synthesizer controller, built in Japan by the Fujigen in the late seventies. 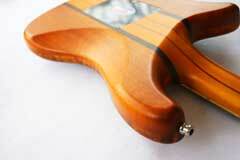 Both guitars have the sustain and rich tone associated with one piece neck through construction. 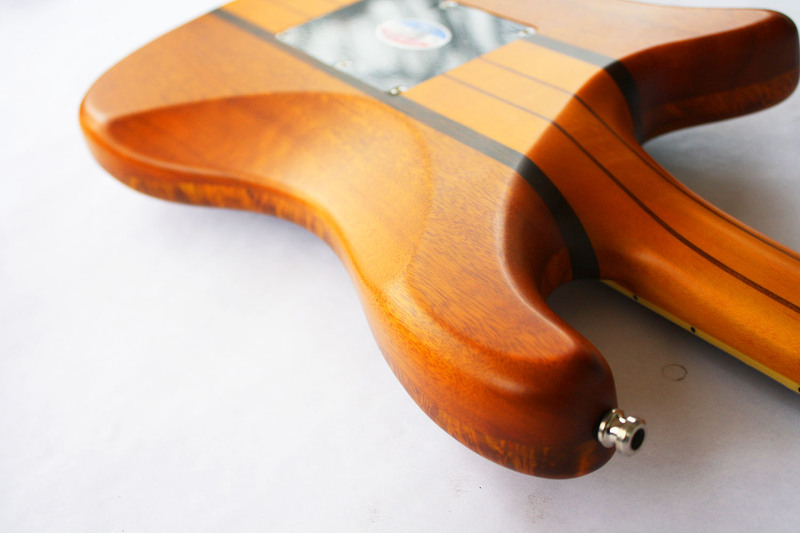 Both guitars have a laminated maple neck, and both guitars feature an ebony freeboard, the choice of freeboard for serious guitar synthesizer controllers. 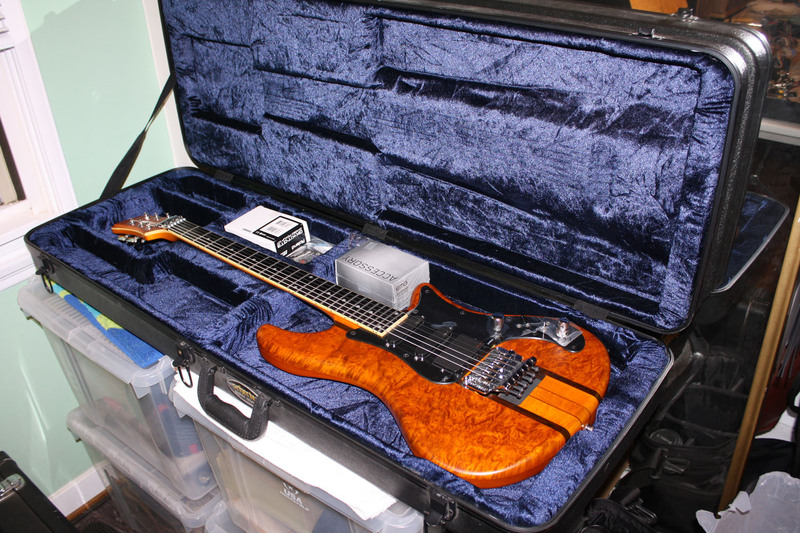 The high-end Ibanez IMG2010 also has an ebony neck, and so does the current LGX-SA, top of the line, flagship guitar synth controller from Godin. The Stiletto Classic add more features for added playability and versatility: 24 jumbo frets and an ultra access design for true, two-octave range on the freeboard. The neck on the Stiletto Classic has the fast, ultra-thin profile. 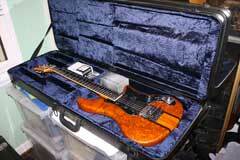 The guitar has a Schecter Locking Tremolo system, built by Gotoh. 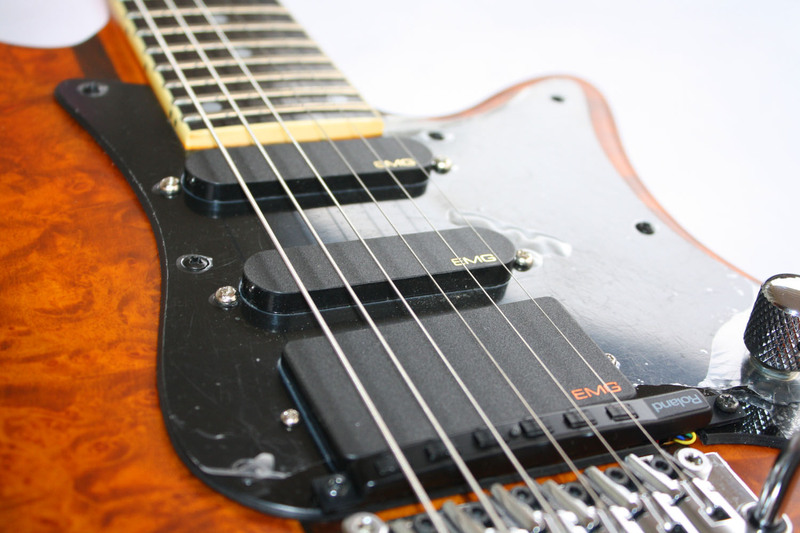 And finally, there are three EMG active pickups in the Stiletto Classic, an EMG 81TW humbucker in the bridge, and two EMG SA pickups in the neck and middle position. 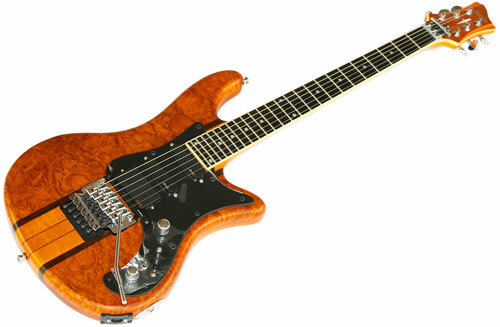 01 -Schecter Stiletto Classic With VG-99 "Sevilla"
This is a performance piece using the Roland VG-99. The Schecter Stiletto Classic is used to play all the guitar parts, bass, and most of the synth and MIDI parts in this demo as well. A GI-20 was used for some of the MIDI tracking. This was inspired by the factory preset in the VG-99, "Sevilla" a Nylon guitar patch. 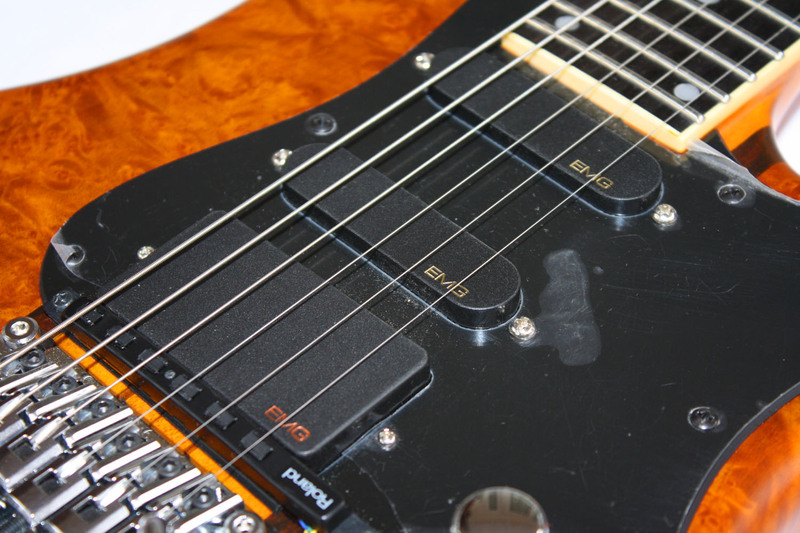 By combining the easy access to the higher frets, with the impressive pitch shifting ability of the VG-99, you can really increase the range of the guitar. 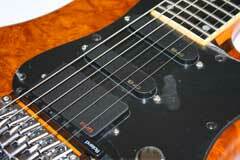 The 215 Tracer patch extends the guitar one ocatve below, and the 248 A:PB+12 extends the guitar range up one octave. 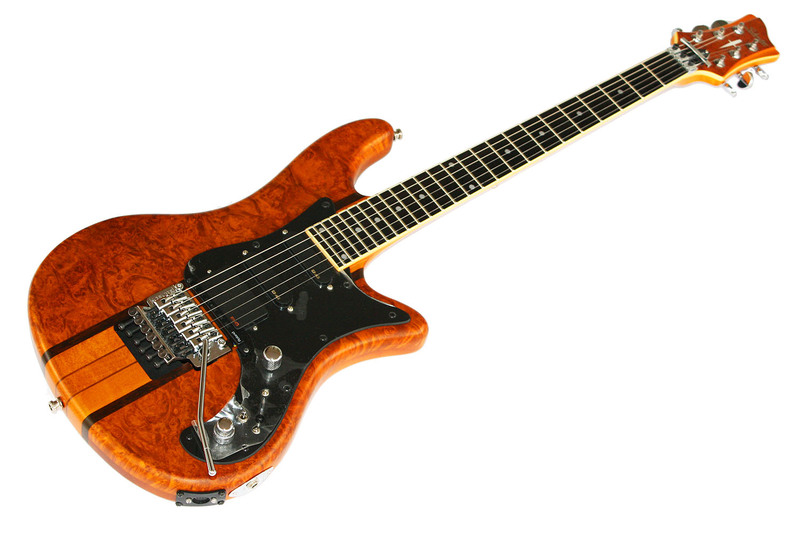 In this performance piece, the Schecter Stiletto Classic is connected to a GK-Expander, which takes the output from the internal Roland GK-3 divided hex pickup, and breaks it out into six individual signals. Each output is then set to a Mark of the Unicorn 2408 audio interface, and the strings are then processed inside Digital Performer using the Reaktor 5.0 synthesizer. All the sounds in this demo were created by Reaktor! The Schecter Stiletto Classic can be used to play a vintage analog guitar synthesizers, like the legendary Roland GR-300 using the RC-1324-VR. n this demonstration, the 13-pin output from the Schecter Stiletto Classic is connected to the RC-1324-VR, which converts the modern 13-pin signals into the vintage 24-pin format. The output from the RC-1324-VR is connected to the Roland GR-300 using a 24-pin vintage Roland cable. 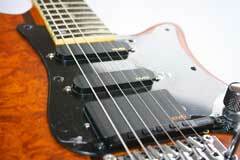 The EMG 81TW is a splitable variation the EMG81 pickup that started a revolution. Utilizing powerful ceramic magnets and close aperture coils, the tone was designed with detailed intensity, incredible amounts of high end cut and fluid sustain. 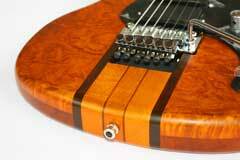 This pickup will make your leads slice right through even the densest mix. The SA pickup combines the attributes of the early Strat sound but with an added midrange response and higher output, giving it "bell-like" ringing harmonics and increased sustain. One single Alnico bar magnet delivers classic overdrive with a smooth midrange distortion, while still retaining the familiar high-end of a single-coil pickup. 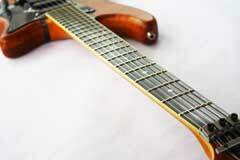 These characteristics provide greater versatility than what is normally found in single-coil pickups. In addition to the versatile features and guitar synth friendly construction, the Stiletto Classic is very easy on the eyes with a body using highly figured maple wings. The Stiletto Classic has a powerful and elegant appearance. 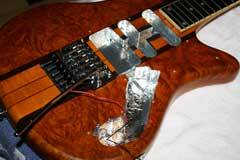 The original guitar electronics have been modified using authentic EMG and Roland parts. The original guitar volume and tone controls have been consolidated onto a single concentric controller, using the EMG A25KX2 control pot. In the position of the original guitar volume control is the Roland GK synth volume control. And a spring-loaded toggle switch has been added to send Roland GK S1 and S2 commands. The Stiletto Classic still has the ability to split the output coils on the 81 TW humbucker, but the coil split switch has been stashed underneath the pick guard. The player can choose to install the switch at any time by simply drilling a hole and mounting the switch. The current configuration of controls was selected to keep control panel clutter to a minimum. 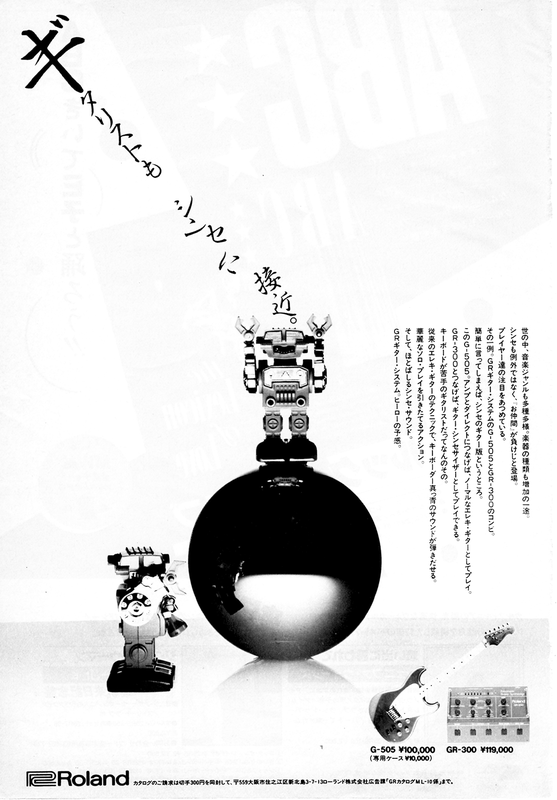 Careful observers will notice the GK-3 divided pickup is mounted "backwards." This was to keep the extension arm away from the hand when palm muting. 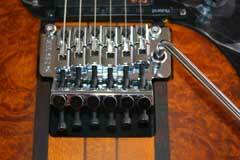 This is, incidentally, the same way Roland mounted the pickup on the rare Roland GC-10 guitar synthesizer controller. Normally, this would require the GK setting to also be reversed. 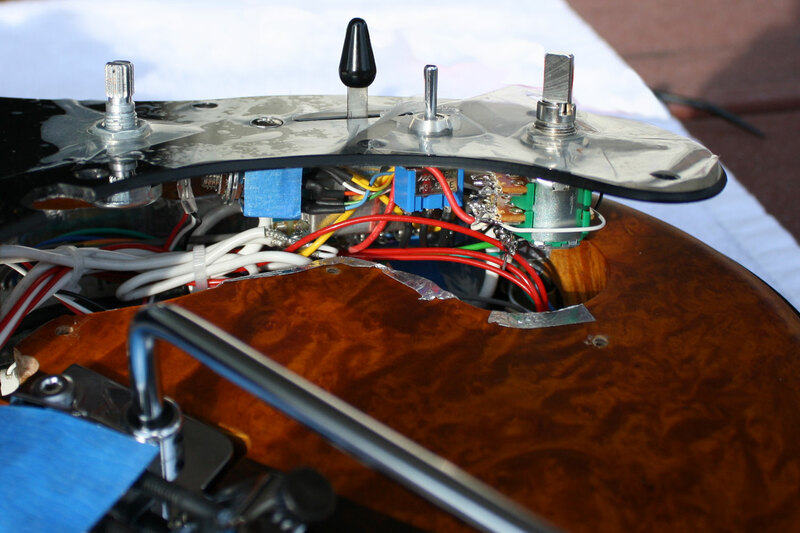 However, when the pickup was installed, the wires from the GK pickup were also reversed, restoring the original polarity of the GK-3 pickup. Also, the GK-3 LED was not installed, and the gtr/gtr+synth/synth switch was not installed. 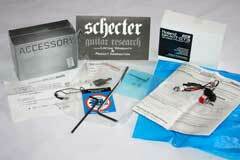 These parts are included if the buyer wants to add them to the guitar. 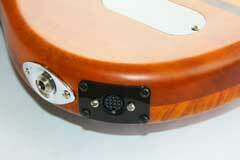 On the side of the guitar is both the 13-pin and standard guitar output. When the guitar is attached to a powered Roland 13-pin synthesizer, the active EMG electronics get their power from the Roland synthesizer. 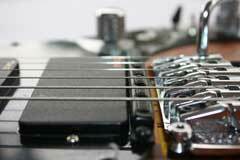 When a 1/4” cable is plugged into the guitar, an internal 9 volt battery supplies power to the active EMG pickups. Warning: do not have a 1/4” cable plugged in and powered Roland synthesizer active at the same time. In this circumstance, the EMG pickups will be receiving power from both the Roland synth and battery at the same time, which can potentially cause damage. 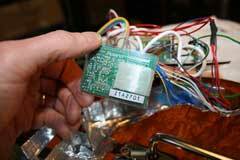 The battery supplies +9 volts of power, but the Roland synth supplies +7 volts of power. As a results, there is a very slight hiss, or loss of headroom when using the Roland synth power. 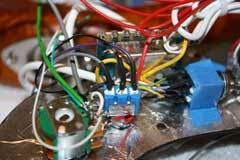 If you want to separate the EMG power supply from the Roland power supply, this is a very simple modification. Just disconnect the (one) red power wire that connects the EMG power supply to the +7 volts on the Roland. 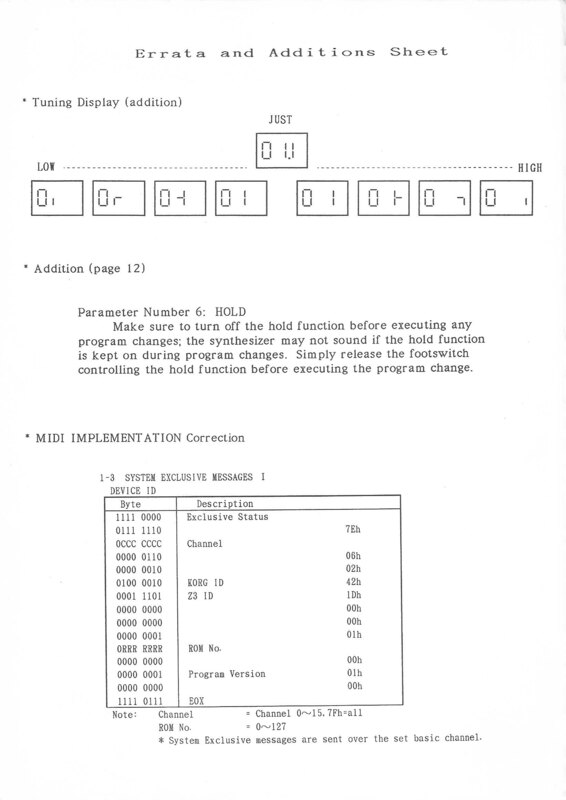 I experimented with this when I was first trying out configurations. 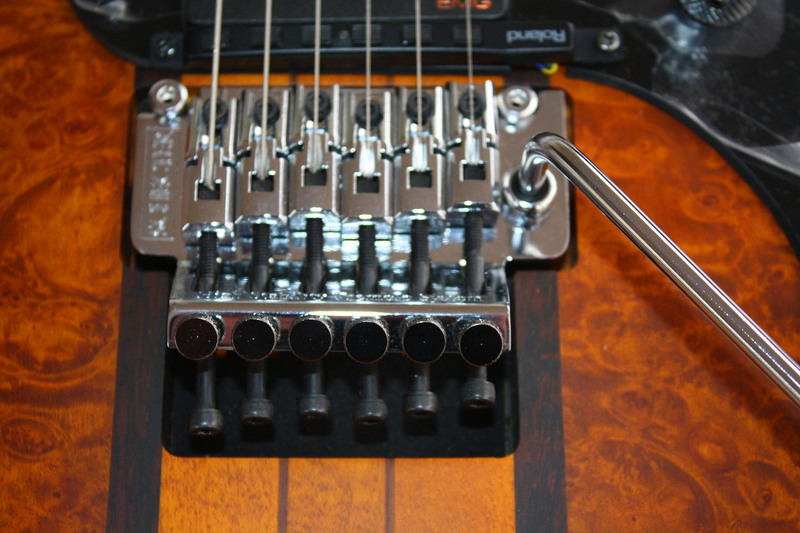 In the video clip, at 10 seconds, you hear the EMG pickups as powered by the +7 volts, and they sound very, very clean (this point is at the closeup of my fingers after playing the main theme). I would suggest this: before making the modification, play it yourself and see if you can hear anything that needs changing. For me, I liked the convenience of not having to rely on an internal 9 volt battery. "the schecter stilletto classic is, simply put, the most amazing versatile, and beautiful guitar i have ever had the pleasure of playing. this is the guitar i have been searching for my entire life. i play a 1972 gibson les paul and a frankenstein strat with a 57 body and an 80s maple neck with a roller nut. niether one comes close."